The final day of the €1,800+200 partypoker World Poker Tour National Cyprus Main Event started with 12 players remaining from the original 172-entry field. 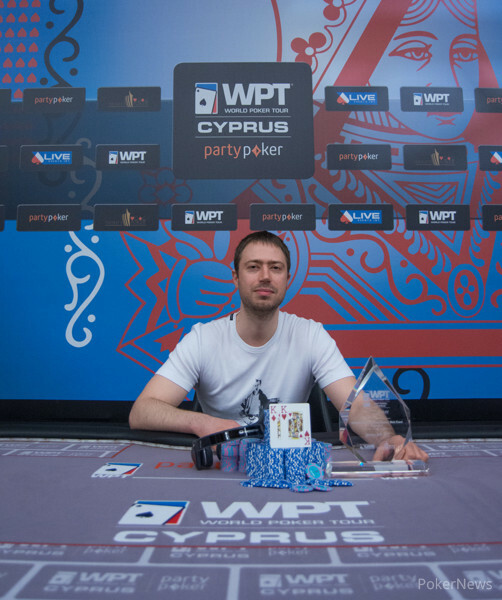 After more than eight hours at the tables, Atanas Kavrakov secured the title and the €75,000 first-place payout. The Bulgarian player overcame a slight chip disadvantage in heads-up play against Majid Ejlal Noubarian, battling back and clinching the title when he flopped quad kings on the final hand. For Kavrakov it marks the biggest score of his career and pushes him over $300,000 in live tournament cashes. His biggest result coming into this tournament was $25,000 for a third-place result in an EPT San Remo side event. Noubarian, who dominated most of the final day, locked up €52,300 for his runner-up finish. Ejlal Noubarian was the chip leader when the event resumed on Monday, but there was plenty of play left with the average stack at 60 big blinds. Aykutalp Yilmaz was the first player send packing on Monday. He had a kicker problem with against the of Vitalii Grekul to finish in 12th place. Grigorii Rodin followed in 11th place after going all in as the short stack with pocket tens. Jacques Torbey had three-bet and called off with to score the knockout after the board paired twice and counterfeited the Russian's pair. The unofficial final table was set with the elimination of Carl Maertzen in 10th place when he put his last 24 big blinds in preflop via a four-bet shove with . Nabourian's immediately found a set on the flop and Maertzen was drawing dead by the turn. A spectacular three-way all in saw Mohamed Almani depart in 9th place after putting his tournament life on the line with . Marco Della Tommasina was also at risk in the hand with against the chip leader Nabourian who held , but the Italian spiked a two-outer to triple up and stay alive. A short while later Ercan Olgun was at risk with to end up second-best to Atanas Kavrakov's , again the short stack was drawing dead after the turn of a board and had to settle for eighth place. Vasili Kesnin was crippled after losing to the of Kemal Sevevi and couldn't return the favor with versus Nabourian's , ending up in seventh place for €12,312. Sevevi's karma would be used up as joined the rail next in sixth place after running his into the of Jacques Torbey. Three all in situations in a row left Vitalii Grekul out of chips as the Ukrainian couldn't improve with against Torbey's and finished in fifth place. 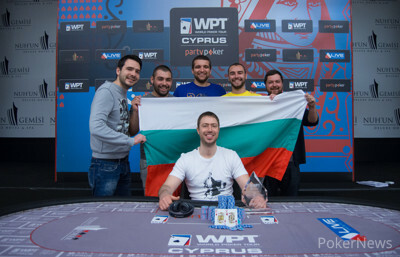 Down to four players, Nabourian won a huge flip with against the of Kavrakov despite the Bulgarian also picking up an additional flush draw on the flop. Short stack Della Tommasino had laddered up all the way to fourth place before running out of chips with versus Kavrakov's . Three-handed play saw Nabourian pull away and Torbey was crippled after losing with pocket queens to the pocket kings of Kavrakov. Torbey couldn't recover and lost the final chips with against . Nabourian started the heads-up match against Kavrakov with a slight lead but quickly fell behind two-to-one. In the last hand, Noubarian four-bet shoved with and Kavrakov called with to flop unbeatable quads kings on a board of and secure the victory in style. The next stop of the World Poker Tour National is at the Asper's Casino in London from Feb. 12-15, and the PokerNews live reporting team will be back to bring you all updates until a winner is crowned. In the meantime, check out the updates of the Aussie Millions Main Event and the AU$100,000 Challenge from Melbourne, Australia. The action started with a raise to 135,000 by Majid Ejlal Noubarian and Atanas Kavrakov three-bet to 330,000. Nabourian gave it some thought, looked at the dealer and then announced all in. 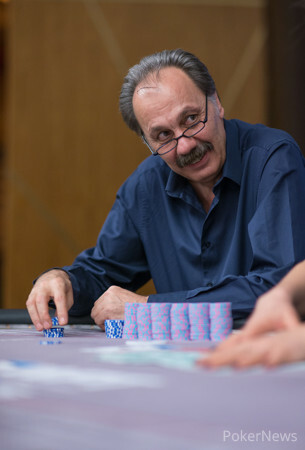 Kavrakov slid forward a stack of chips quickly for the call. With a flop of , all hopes of a comeback for the Iranian were shattered and the decision over the tournament win was already done. The meaningless on the turn and the river officially put an end to the event and Noubarian was eliminated in second place, good for a payday of €52,300. Kavrakov takes home the trophy as well as €75,000 in prize money. A recap of today's action will be available within the hour while the winner shots are currently taking place. Majid Ejlal Noubarian was about to close the gap and get back to even stack, but Atanas Kavrakov won the next sizable pot. The Bulgarian called a raise to 130,000 and both players checked the . Kavrakov then bet the turn for 140,000, which was called. The final barrel worth 230,000 after the was too much for Nabourian though. Nothing major happened after the one successful check-raise, Majid Ejlal Noubarian has been winning a few small pots but still remains in second place. Majid Ejlal Noubarian was getting overrun by his opponent so far, but the Iranian just won the first sizable pot in heads-up play. After a min-raise preflop, Nabourian check-called a bet of 85,000 on the flop and then check-raised the turn from 160,000 to 425,000. Kavrakov sighed and let go. Majid Ejlal Noubarian raised to 90,000 and Atanas Kavrakov just called to see the flop of . The Bulgarian check-called a bet of 130,000 and both players then checked down the on the turn and the on the river. Kavrakov turned over the for a flush and raked in the pot. Atanas Kavrakov raised to 80,000 and called the reraise of Majid Ejlal Noubarian for a total of 270,000. On the flop, Noubarian check-called a bet of 200,000 by Kavrakov and immediately faced another barrel worth 350,000 on the turn. Noubarian slowly took a sip of coffee, stacked enough chips to call and then folded his cards. Majid Ejlal Noubarian called a bet of 140,000 by Atanas Kavrakov on the turn and then faced another barrel worth 320,000 on the river. The Iranian grabbed enough chips for a call and then stared at his opponent for almost a minute before announcing the call. Kavrakov turned over for two pair and that was good enough. In Heads-up, all levels are now 30 minutes.